This portrait is such a prestige piece that it is signed by the artist. Opinions vary from the 3rd to the 1st century BC. I’ve no strong opinion, other than to emphasize that to ‘identify’ it as one of the Scipios, especially one of the famous ones, is pure fantasy. What we need are some portraits with provenance. And, lo! we have them. They just are barely published (as far as I can find so far and I’d be very happy to learn I’ve missed shiny new fully illustrated catalogue). 1,756 readable seal impressions were found in a controlled excavation of a Hellenistic Archive beneath a sealed deposit layer securely dated to 145BC. Of those 20%, that’s right TWENTY percent are portraits. The only color image I can find is the one above. These are the only other images I can find from the preliminary publication of the archive. My first reactions are two fold. Portraits as seals were not limited to royalty and the style of these portraits is comfortable between ‘dynamic idealism’ and ‘rugged verism’. Are any of them Roman? Who knows. But they are all part of Hellenistic repertoire. Flamininus could have easily have a portrait seal ring in such a style, but that’s not even required. Just the idea that objects could be validated and made official by the impression of a portrait might be catalyst enough for the creation. Yes, portraiture on coins is predominantly associated with kings, but kings put many many other images on their coins as well. The portrait-equals-king and king-equal-portrait formula may not be as rock solid in 197 BC as we often flippantly assume in Roman numismatic discussions: no one was worried about Flamininus overthrowing the Roman body politic in the same way they were about Caesar in 45/4 BC. Neither is really that close in design or style even if they show a figure on a ship. There might be a lost Sidonian type with a figure seated on just prow, but I suspect the inspiration for the design came from trade connections with the North. I sent the wire transfer for the deposit on the Istanbul place. SDA said to me first thing this morning ‘there’s no one I’d rather have adventures with’. It will be a grand adventure, but Ditmas Park is pretty fabulous too. This morning I cramped up between 1.5 and 2.5 miles and had to walk, so I did an extra loop at the end of my route around a long block. 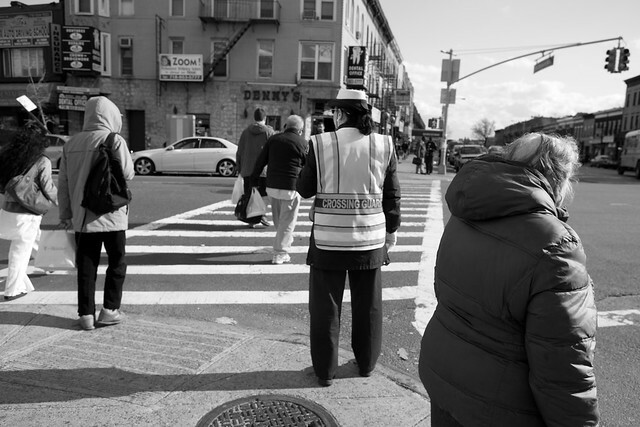 At the end of that very last loop a school crossing guard, who I swear I’ve never seen before, stopped me and with a big smile said “You made it round really fast! I was watching.” I love the eye contact and smiles along the way, but that comment takes the cake. What is it? 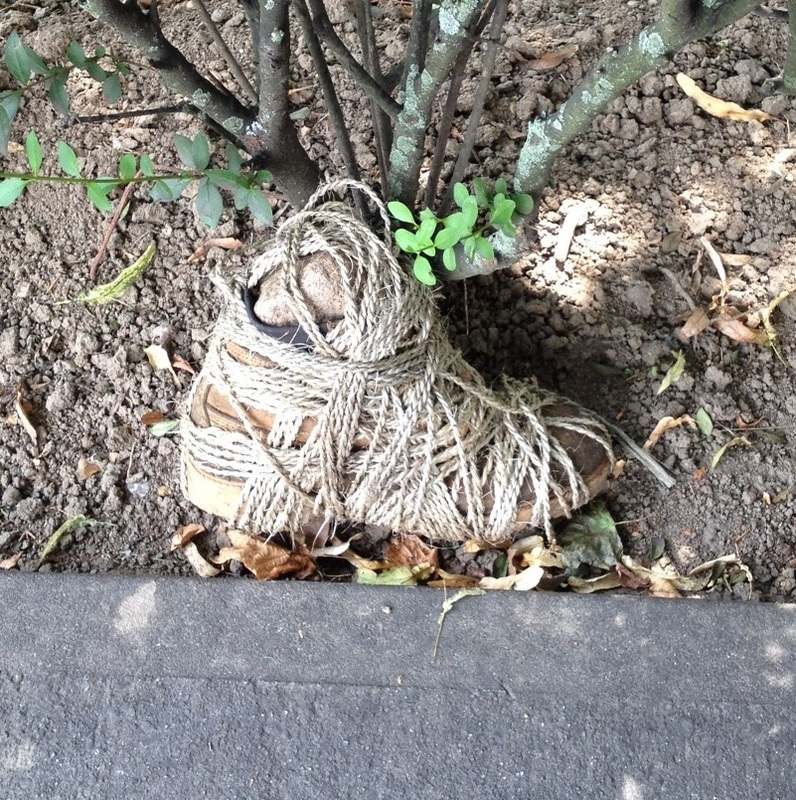 It’s a single work boot with a very large rock in it that has been bound in an exceptionally complicated pattern and placed just inside the perimeter of a church yard. Art? Binding Spell? Symbolic Catharsis? Joke? All of the above? You choose. No, I did not touch it. No, I’ve not gone back to check on it. 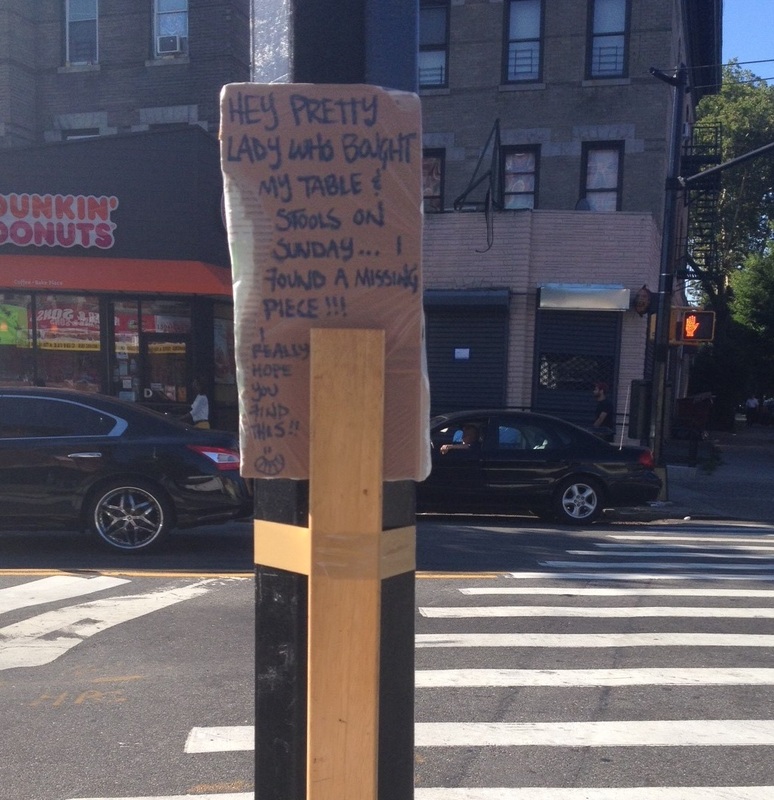 The sign reads “Hey Pretty Lady who bought my table and stools on Sunday… I found a missing piece!!! I really hope you find this! !” And yes, that is a piece of wood taped to a lamp post. The toothy smile drawn on the sign is really the best part. I’ve stared at this particular specimen of this particular type so much that when I came across an image of a different specimen in a book this morning part of me wanted to say oh that’s not the right image. This can happen with famous or just easily accessible specimens of types. The historian or student can start to think the one illustrative example IS the type. This leads to some unfortunate readings. The lesson is that unless one has seen as many specimens of a type as possible its really very dangerous to start generalizing. A lazy die cutting can turn into a whole (sexualized!?) reading. There are ten Flamininus specimens according to C. Botrè, “Lo statere d’oro di Tito Quinzio Flaminino: una coniazione straordinaria,” RIN 96 (1994/1995): four in museums: Athens, Berlin [?? ], London and Paris; and six in private hands including: WAW, 109 = Hunt I, 111, the Ley collection piece = Triton III; 30 November 1999, 815; LEU 81, 187; NAC 39 (16.05.2007), 85. His face may be fatter or thinner, rougher or smoother, hair wilder or sedate based on the specimen. The controversy over how this image fits into Hellenistic portraiture traditions and/or Roman aesthetic conventions is not going to be resolved soon, but any discussion should be based on the examination of all possible specimens. First it an issue by two aediles, not regular moneyers. Why? Does it have to do with their games? 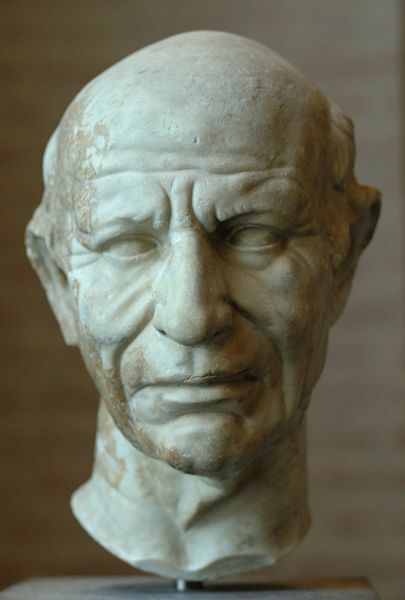 Scaurus lived long in the mind of Romans for the extravagance of these ludi. Or, is it because aediles might also over see the grain supply? Then there is sheer volume of this issue. It would need to be part of a discussion of estimating mint outputs and possibility of correlating that with state expenditures. 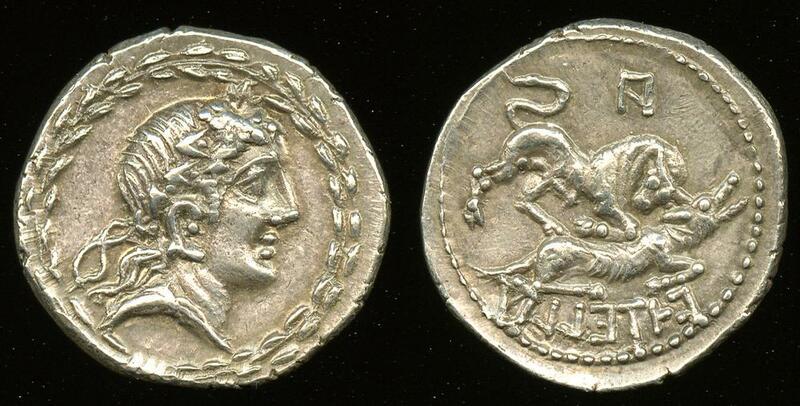 And then there is the reverse with the capture of Privernum. The should get a mention in the conquest of Italy section but the moneyer’s family connection is fanciful at best so that goes nicely with my discussion of familial legends. Oh and it’s one of the rock solid coin types for dating as we have independent testimony regarding the issuers aedileship, meaning lots of other types are dated by relation to this one. It’s like a book in one damn coin. Okay. Now that I’ve got that out of my system I’m going to go write 750 words or more for the actual book. Many vices and virtues can be equally two-faced. Thoroughness can be a paralyzing standard for an academic endeavor and yet most necessary for the validity of the results. 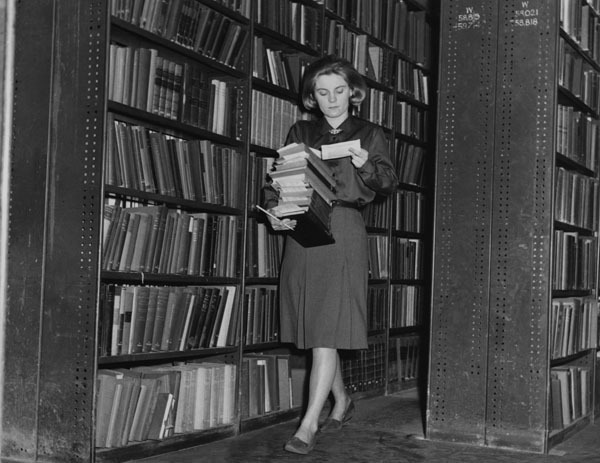 Chasing obscure bibliography, the fear of finding one key piece of scholarship post production, endless combing of catalogues and databases can result in rock solid peer-review worthy work, but also grind the process to a snail’s pace. Searching a database can be easier than actually articulating words what one thinks. I indulged in so much collection of bibliographical references over this weekend that the Inter-Library Loan Librarians must be cursing me this morning. A disgusting number of requests were filed. In due course they will need to be incorporated into the book, or not, as the case may be, but waiting on their arrival or spending more time on the bibliography will not actually move the book forward or make the final product stronger at this point. I’m usually a ‘measure twice, cut one’ type of writer. Why compose a sentence until one can write the footnote that guarantees the accuracy of the statement? This makes writing slow, nervous work. The author of another book in the series wrote to me that he was trying to draft chapters: “very very fast (aiming at 750 words per day), in order to get something down on paper which I could edit”. Ah editing. Being open to self critical revision. That is certainly a virtue I could due to cultivate. So we’re going to try something like that this week: just writing from the notes on file and the ideas in my head. If this blog has proved noting else, its that I don’t suffer from a lack of words. This time Augustus is laureate. Farney gives the only really substantial discussion of these moneyers’ choice. For the background of the foedus and the role of the Antistius see Dionysius of Harlicarnassus’ account. He says the treaty still existed in his day written on the cow (not pig!) hide that was the sacrificial victim at its consecration. All in all, it is a story that paints the Tarquinii in a really awful light, with the Gabini being incorporated into the Roman power structure as a calculated and unexpected gesture of magnanimity designed to ensure their loyalty, even after being the victims of a terrible deception in which they were tricked into stoning one of their most loyal leading citizens… The story as Dionysius tells it is hardly appropriate for numismatic commemoration. R. E. A. Palmer, ‘A new fragment of Livy throws light on the Roman Postumii and Latin Gabii’, Athenaeum 78 (1990), 5-18 thought there was a different foedus in the forth century but his reading of the new fragment is rebuffed by Gabrielli. Perhaps there is new light on what the coins might mean in this newer article, but its still behind the pay wall even with my university’s subscription, so I won’t know today. Other thematically relevant bibliography may include: Bensmann, Alexa. – Die « republikanische » Seite der augusteischen Münzprägungen : Bemerkungen zur Bildsprache der « IIIviri aere argento auro flando feriundo ». Numismatisches Nachrichtenblatt: 2008 57 (9) : 346-349 ill.